7" pl 1988 Tonpress DS-25-A Promo. Unique sleeve. The promo was made in 60 copies. Blue Monday is known to be the most sold 12" single of all time. It is said that Blue Monday was created in the studio while the band was experimenting with drugs and a new drum machine. 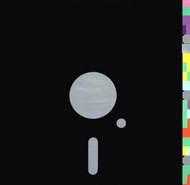 Peter Saville got the idea of the floppy disc sleeve when he saw the disc Stephen used to store the sequencer information on. B: "Ho El & Tel!" B: "I Said Where's Murder?" Blue Monday US Promo 12"